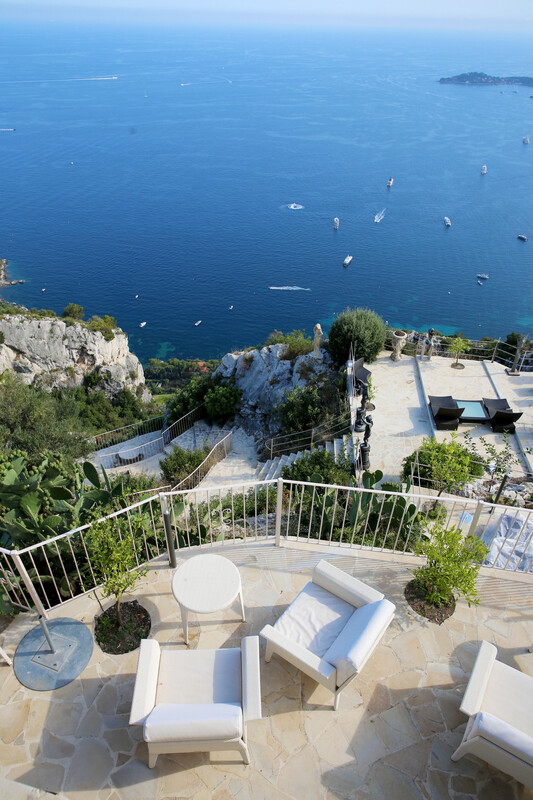 Situated high up on a rocky cliff overlooking the French Riviera, is the enchanting medieval fairytale village of Eze. Wandering through the winding cobblestone pathways is like walking right into the 15th century. If a knight in shining armor were to emerge on horseback clip-clopping through the village, it wouldn’t seem at all out of place! After just a bit of strolling into this magical town, you’ll come upon the fabulous 5-star hotel, Chateau de la Chevre d’Or. This delightful little piece of heaven is luxurious and replete with all of the modern amenities, yet it maintains the medieval charm of the rest of the village, with its bougainvillea-draped stone walls and ancient architecture. Equally as stunning as the hotel and town are the dramatic views to be found in any direction. Looking one way reveals the beautiful hillsides of the French Riveira and its abundant greenery which is generously dotted with lovely chateaus. Then, turn your head slightly and your eyes will be presented with that gorgeous sparkling azure Mediterranean Sea with many a yacht sailing by. Chateau de la Chevre d’Or offers 31 guest rooms, 7 suites, and a Panoramic Suite. 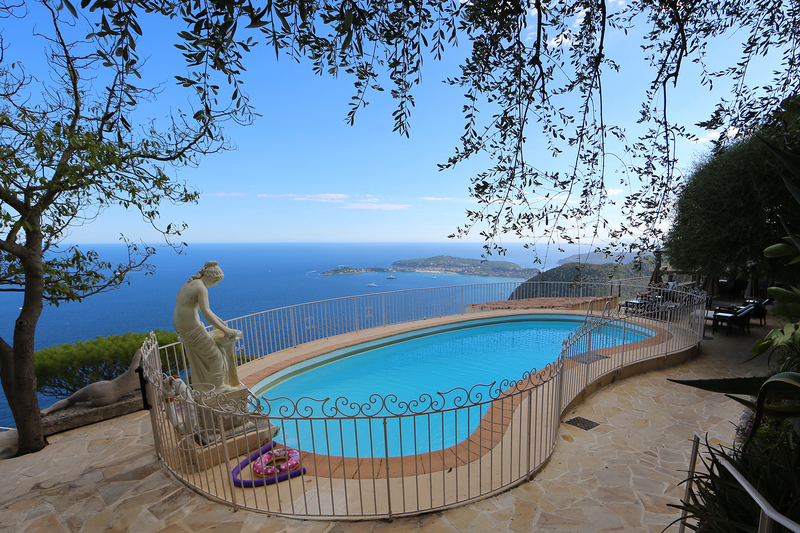 Each room is uniquely designed and decorated and has a wonderful view of the village, gardens, or the Cote d’Azur. The suites are named after artists who passed through the hotel or the village at one time or another. The room I stayed in had two levels. The bedroom and sitting area were upstairs, and then you follow a narrow winding staircase down into the huge elegant “cave” bathroom. This bathroom was quite the epitome of luxury with its large stone ceiling, marble floor, double sinks, jacuzzi bathtub, cozy bathrobe and slippers and medieval ambience. All rooms come with complimentary wifi, air conditioning, safes and mini-bars. There is an outdoor pool and Jacuzzi, and multiple levels of terraced gardens, patios and sun decks with lounge chairs. There is a fitness room, a meeting room, and valet parking. You’ll find someone to lend assistance with your luggage when you arrive, as you may have an uphill trek to get to your room. The Panoramic Suite is the most extravagant option, and its size is over 1400 square feet. It has a large bedroom and lounge with huge picture windows, a giant bathroom with Jacuzzi built for two, its own terrace and private infinity pool, as well as its own outdoor Jacuzzi. Bring a pair of good walking shoes! You will want to take walks around the village and the beautifully landscaped grounds of the hotel. You can enjoy sculpture gardens that include both contemporary and classic French statues. There is a life sized chess board, animal sculptures, and a small army of larger-than-life terra cotta Chinese warriors. There are fountains, flowers and a lovely gazebo. Fitness enthusiasts will appreciate the many stairs to be climbed to get to these different terraces. With 4 restaurants and a bar, there is no shortage of fine dining options, including the 2 Michelin Star restaurant La Chevre d’Or. This is a very upscale restaurant with a menu that celebrates the local terrain. Each plate is a delicately assembled work of delicious art. They also have an extensive wine list that includes over 15,000 bottles of wine! The other 3 restaurants are open during the warmer months. Les Remparts is known for its spectacular terrace views and was actually rated as one of the top 10 most exceptional terraces in the 2015 Michelin Guide. It offers delicious lunch options of mostly Mediterranean and Italian cuisine. L’Eden offers a delicious a la carte Mediterranean menu. They are both a nice choice for dinner. Le Café du Jardin serves a lighter, more casual fare out on the terrace. Simple and fresh sandwiches, salads and pizza are favorites. 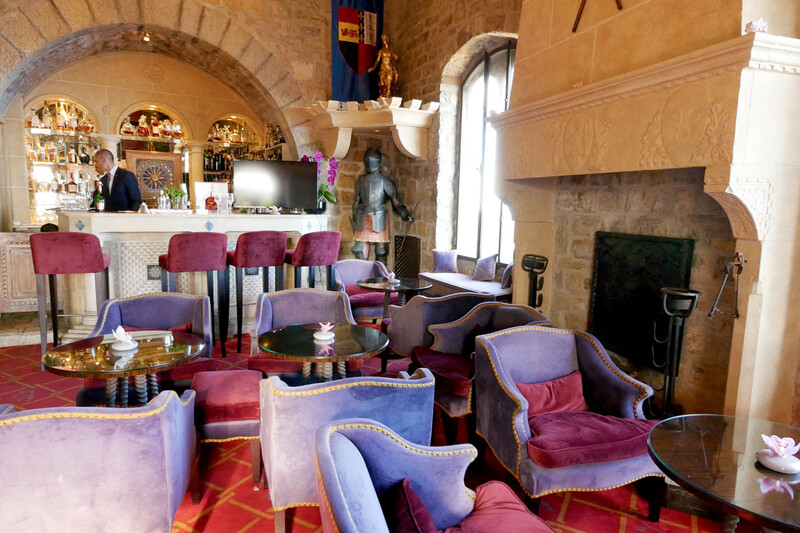 The bar lounge with its medieval castle ambience makes for a comfortable spot to meet with friends. It is very richly decorated with deep red carpeting, stone walls, wrought iron chandelier, large fireplace, and huge windows revealing the gorgeous Cote d’Azur. It also accesses the outdoor terrace. They offer cocktails, champagne, cognac and a selection of cigars. There’s an abundant array of options as to how to occupy your time while staying at the Chateau de laChevre d’Or. 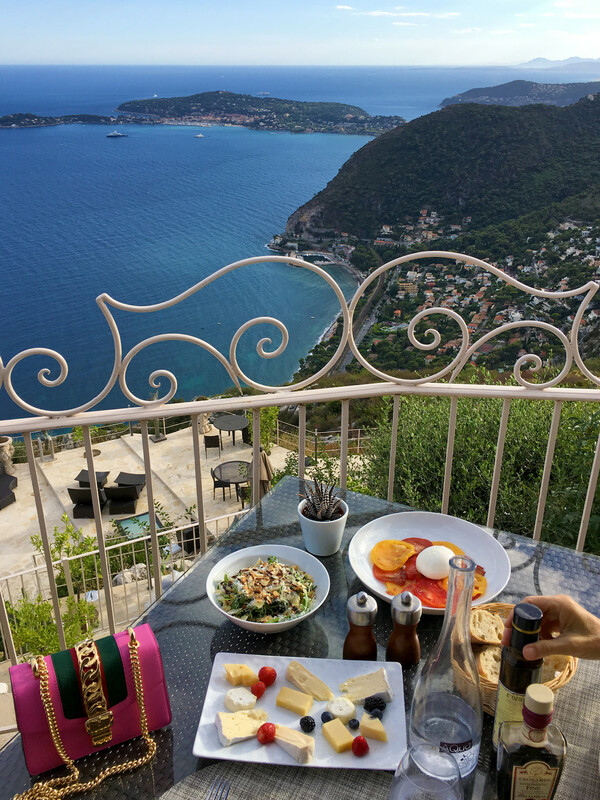 There are many trendy little shops, artsy boutiques, and galleries around Eze. You can enjoy a good hike, workout at the fitness center or an afternoon at the pool followed by a relaxing massage. Eze is located between Monaco and Nice so within just a short drive you can enjoy some time at the beach, do a little whale/dolphin watching, tour a few museums, choose your pick of theater shows, visit botanical gardens, take a private plane tour of the area, or browse the private antique car collection of Prince Rainier III. Nice and Monte Carlo are also known for vibrant night life with restaurants, casinos, cabarets and live music. Chevre d’Or is a wonderful choice for couples looking for a romantic getaway. It also makes for a great family vacation. Both kids and adults can gain a glimpse into medieval history while visiting here. It is a serene and tranquil spot that is truly one of the most charming places in France. Did you shoot that drone footage in the begging of the video? So awesome! This place looks fab! Thanks Vanessa! Yes, it was so heavenly! Awe thank you so much!!! That means a lot and made my day! Anna you are so lucky that this is just a weekend getaway for you! I am so far away it had to be a 2 weeker! Love your photos. The dresses and Gucci bag are so beautiful too. I haven’t been to the French Riviera yet, but would love to visit. Hi Miki, Thank you so much! You’ll have to get over there soon! It is spectacular! Stunning photos. Love it so much. I just moved in the French Riviera and by looking at your photos, there’s so much (for me) to discover.